19 New Games for the Kindle! So what are the 19 new games available for the Kindle? At least seven of them were released within the last week… In fact, last Tuesday saw the launch of five different Kindle Games. It was originally a card game — and I even remember a TV game show version — but it’s always had the same fun rules. You’ll reveal what’s hidden on the bottom of the cards (or tiles) — two at a time — while you try to find a matching pair. As you peak under more of the tiles, you’ll have to remember where you last saw it’s match! And to make things even more interesting, this Kindle version gradually increases the number of tiles to choose from! Welcome to 17th-century London! It’s 1603 in this “interactive fiction” game, which promises to let you interact with both historical and fictional characters, “and thwart an occult conspiracy that threatens to bring down the entire city — or worse.” It’s billed as “a novel-length work…in which your choices control how successfully you navigate the story.” There’s puzzles along the way — plus a hint system (described as “elaborate”) in case you get stuck somewhere along the way! Sudoku is probably the most famous Japanese logic puzzle in this set — but is also offers you four more! There’s also Katkuro, which offers mathematical clues about which digits should be used to fill in the squares. Another game — “Number Island” — involves choosing the right shades for the squares which surround different “islands” of numbers. “Picture Cross” sounds a little like “Pixel Perfect Puzzles,” in which there’s clues about the number of shaded pixels for both the rows and columns of a grid. And Hitori is like Sudoku in reverse, where your goal is to black out some of the numbered squares to eliminate all the duplicate digits in a row or column! 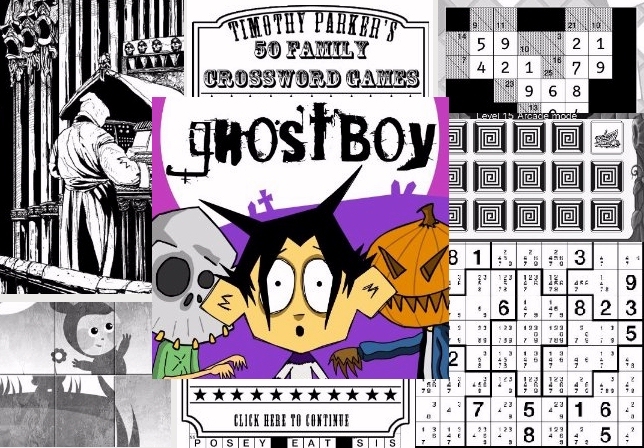 And on Wednesday, another interesting new game was released — called Timothy Parker’s Family Crossword Games. He’s the editor of crossword puzzles for USA Today, and he’s created a set of puzzles that includes a few that are specially designed for kids. (“Spend time with your little future puzzle masters in a fun, educational way,” suggests the game’s description at Amazon.com.) There’s already some other crossword puzzle games on Amazon, but I like the “art deco” style of Timothy’s graphics. So that’s seven new Kindle games, but that’s not even half of them. There’s some missing digits in the grid, along with mathematical clues about what the total would be if you added all the digits together! Meanwhile, another company called “16 Hands” has released Doodle for Kindle is one of the most original new games that I’ve seen. You use the Kindle’s controller to sketch a line across the screen — so it’s basically a drawing application! 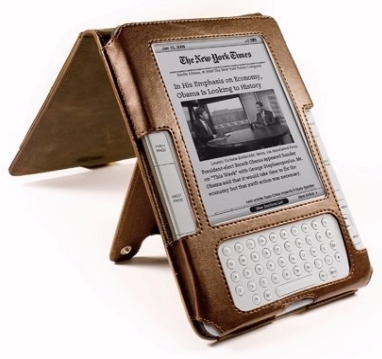 “This reminded me of Etch A Sketch,” wrote one reviewer on Amazon. “With the 5-way, you can move a pixel around on the screen to make a sketch…” And there’s also another new Kindle game with “Doodle” in its title – called Doodle Fit — which is more of a conventional game. In Doodle Fit, you arrange different-sized blocks until they’ve create the target pattern that’s been supplied (as a “doodle.”) And until midnight on Monday, it’s on sale for just 99 cents! And there’s also two new “application” offerings that were released last month for the Kindle. TakeNote is basically a memo pad for your Kindle, which (according to its description) “lets you jot down whatever is on your mind quickly and easily.” And Finance Manager offers a financial calendar with alerts about bills which are coming due — plus 12 different “financial calculators” that can crunch the numbers on mortgages, the rates for long-term loans (using both compounding and simple interest), and even one for calculating your credit card payments! Back in June I’d written that there were now over 100 games available for the Kindle. And then 10 more new games came along in July. So we’re up to at least 129 games for the Kindle now. In facst, there’s so many more new games, I’m wondering how long it will be before there’s finally 200 games available for the Kindle!